Discovery Cove Wants to Wish you a Happy Mother’s Day! 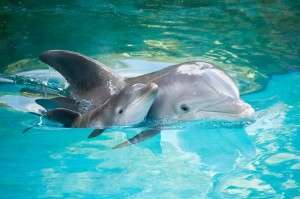 Our friends over at Discovery Cove, along with some of their new born dolphins, want to wish you and your family a Happy Mother’s Day! Orlando Fun and Food also wants to send our warm wishes to our moms on this special day! This spring, Discovery Cove® in Orlando welcomed two new baby dolphin calves to mothers Natalie and Rose. The calves are forming strong bonds, learning from their mothers and exploring their environment. Previous Post Marlow’s Tavern in Orlando serving up great food with fresh, local ingredients! Next Post Potter Fans: Information about the new coaster to be revealed on 5/13!